I LOVE that adding little dashes can make any occasion special and worthy of cheering! 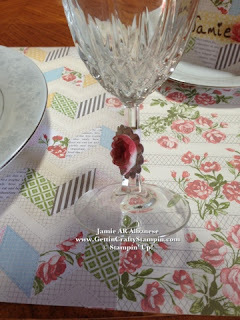 I couldn't resist pulling our the nice China dishes, crystal water glasses and celebrating with a little Paper Crafting fun!! 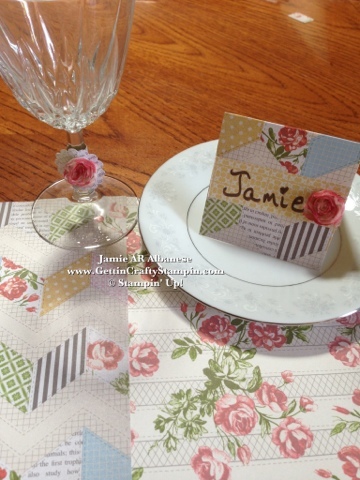 This stunning paper, from the Tea for Two Designer Series Paper (Spring Mini) creates a stunning setting with a place mat, napkin ring, glass ring and name card. 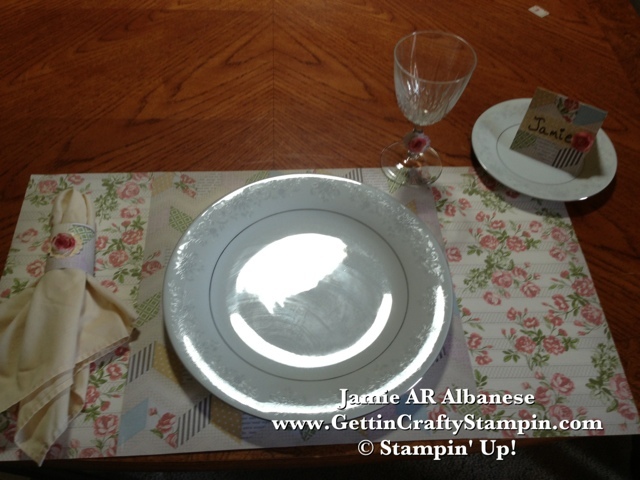 The beautiful patterned paper is 12"x12" so I cut one sheet and adhered it to each side with our SNAIL adhesive. 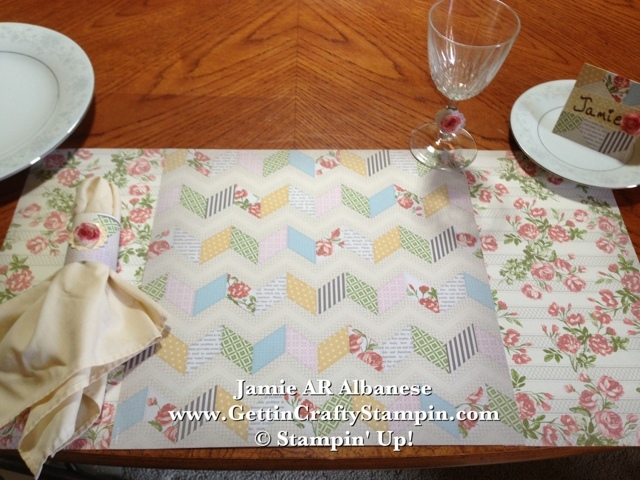 The patterns match and though different are a fun way to dress up the table! 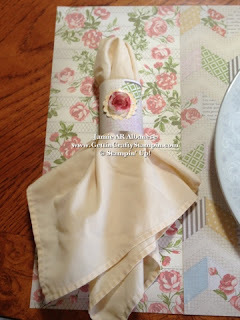 The napkins, that is... here a 2" strip of the Tea for Two Designer Series Paper is accented by our 5/8" Flower Trim (Spring Mini). This Vanilla vintage material rose is colored with our Primrose Petal ink pad. It even resembles the flowers on the paper! The 7/8" Scallop Circle punch adds a break and the pattern (from the opposite side of our double sided paper) is perfectly dyed to match! Wrapping the Stem of the crystal water glass is fun - and if you want to go an extra step, create a Stem Marker by punching the paper and adding an initial for that person! I'm not sure that name cards are in fashion - unless at a wedding - but what a fun way to say something nice while marking a person's spot! With out the plate, you can see the pretty patterns! This 'stitched' paper makes it easier than ever to look like you have done a ton with little effort! 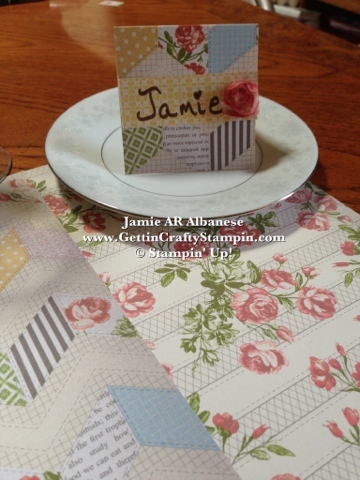 Mixed patterns are so trendy and this quilted look is a fun way to mix mediums and patterns! Clean Up is a breeze - you can either re-use the paper to create something or if dirty (like the settings that will be at my children's pates - lol) toss away any evidence. I know that my kids would love to play making 'art' with any leftovers - a perfect way to keep them busy and out of trouble while we play a card or board game! Celebrate family and friends when they gather! 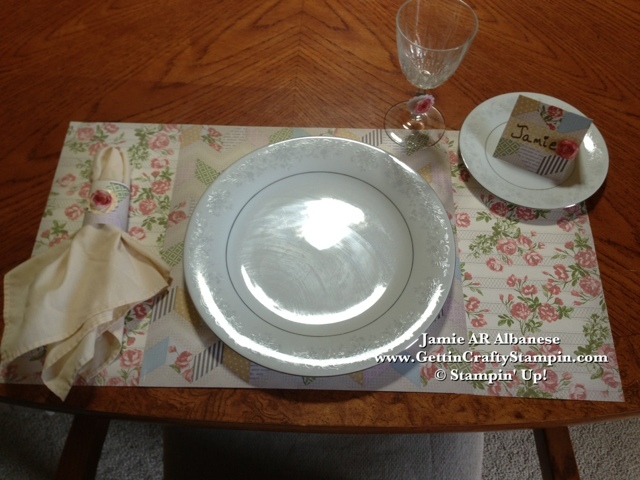 This little effort goes a far way to show that you care and that the guest is special. As I have lost many family members and elders over the past few years - I will always revel in the memories of a hot round of Canasta after the holiday meals... Monopoly and Mexican Train... with a bunch of my family gone these days... I can't get those memories back. Don't waste a single moment of time with those you love.. life is too precious! Celebrate life, love and family!! Want this Paper and our Flower Trim?!?! Click HERE to see this and ALL of our Papers, Flower Trim, Accessories, Punches... FREE to look any time of day! 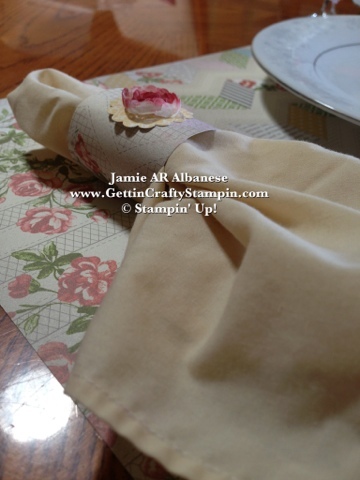 Save 10%* when you select Me ~ Jamie Albanese, as your Demonstrator on any on-line orders! Hostess Benefits are available, too, for any purchases over $150!! * Bonus - any purchases will secure a Free Gift to ALL who order!! Don't delay, get yours today!! Labels: 3D, card making, Decorations, Designer Series Paper, DSP, Easter, Flowers, Paper Crafting, Ribbon, Spring Mini, Stampin Up, Stampin' Up, Vintage, Vintage. Brilliant, this is the best idea I have seen in a LONG time! Love it. Very cute! 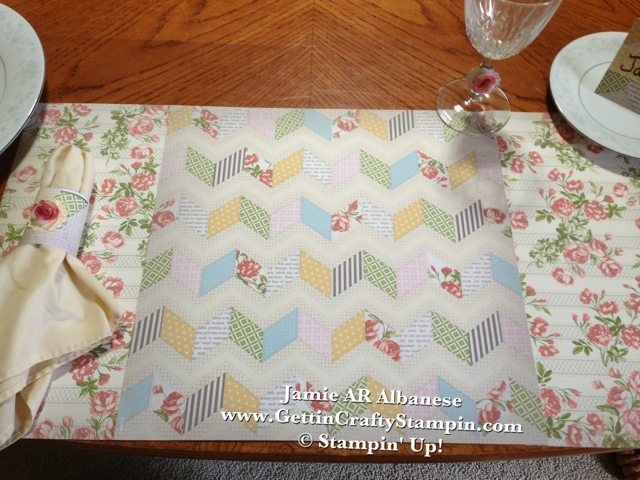 I'm sure you could laminate the placemat so you could reuse it. I agree with MJ. This is brilliant! You have made a stunning place setting. Thanks for sharing your talent with the LNS group this week. Great ideas! Thanks for sharing them.